This species, our only long-distance migrant in the pigeon family, has recently been lost from the county’s breeding avifauna. It would probably come as a surprise to new birdwatchers that just twenty years ago, in our First Atlas, Turtle Doves were recorded in 144 tetrads, more than one-fifth of the county, with breeding proven in 20 of them. During this survey there were just two records of single birds in 2004, and one or two birds in 2006 at Risley Moss. It is not straightforward to track the decline in the county from annual bird reports, in part because its occurrence has been understated as Turtle Doves are not easy to detect in casual birdwatching. Their song, a soporific purring, is mainly heard in the first two hours of daylight; through the rest of the day only 10-20% of birds sing (Calladine et al 1999). Even during the First Atlas, whilst tetrad workers were finding it a widespread species, the annual bird reports declared it to be scarce. In 1992 its county status was changed to ‘very scarce’ (6 to 10 breeding pairs) and by 1994 it was noted that ‘Delamere and surrounding area remains this species’ last breeding toehold in Cheshire’. Appeals were made from 1997 onwards for submission of all data but there were no breeding records in 1998 or 1999, the species was lost from its Delamere haunts, and the last confirmed breeding was in 2000 at Rixton Claypits. From 2001 to 2004 the annual reports contained records of birds seen in the Rixton/ Risley area but nearly all of the published records were of birds flying over just a handful of sites. The species’ demise seemed to be complete when there was no mention at all of Turtle Doves in the 2005 Cheshire and Wirral Bird Report. Their national population index fell by one-third during the period of our First Atlas (1978-84) and has dropped by a further 70% from 1984 to 2004. Turtle Doves today have a substantially earlier close to the breeding season and produce barely half the number of clutches and young per pair than in the 1960s, nowhere nearly enough to maintain their numbers (Browne & Aebischer 2005). Along with the decline in population, their range has shrunk considerably. They were recorded in 25% fewer 10-km2 squares in the national 1998-91 Atlas than in 1968-72 and their retreat to the south-east has continued since then. An indication of its range is well illustrated by the figures for the atlases of nearby counties: 27% of tetrads in Shropshire (1985-1990), 4% in Lancashire and North Merseyside (1997-2000) (and only two records north of the Ribble) and two records of single birds in Cumbria (1997-2001). 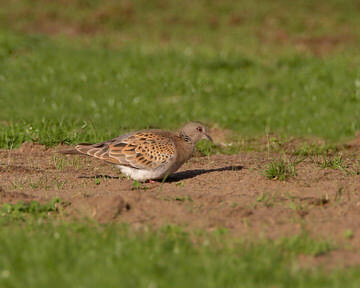 Turtle Doves’ decline parallels that experienced by many other seed-eating species and probably shares some of the same causes, particularly changes in agricultural practice such as the increased use of herbicides and fertilisers. By migrating across the Sahara for the winter they avoid the shortage of food in winter on British farmland, but they face the additional hazards of deterioration of their African habitat and of being traditionally a favourite target of Mediterranean hunters. In the breeding season they feed on a wide variety of small wild seeds and cultivated grain on rather bare ground: in the Delamere area they used to find the edges of sand quarries especially to their liking. They need dense hedges or woodland for nesting (Browne et al 2004), and for safe cover when disturbed. Turtle Doves are still widespread but declining elsewhere in Europe, where they breed anywhere at low altitude, in habitats including hedges, borders of forest, spinneys, coppices, young tree plantations, scrubby wasteland, woody marshes, or scrub, all with agricultural areas nearby for feeding (Tucker and Heath 1994).